I admit here and now that I am a Jimmy Buffett fan. Yet, I do not consider myself a Parrothead. I don't roam the country going from Buffett concert to Buffett concert, nor do I wear any silly costumes at his concerts. I leave that to the most dedicated fans. In my last column, I wrote of the Jimmy Buffett (above) concert experience. I attended his 2 August 2018 concert at the Jones Beach Theater. There is nothing like being surrounded by fellow trop rock fans, drinking all sorts of beverages and smelling certain air-borne odours that isn't considered legal at concerts. I discovered Jimmy Buffett in 1977. I was sophomore in college. I was working at the radio station of the New York Institute of Technology, WNYT. We were not an on air station, but we were piped into several recreational buildings on campus, as well as the music on the local cable "What's On" channel. Most of our listeners came from there. The Buffett album Changes in Latitude, Changes in Attitude released in 1977. Yes, that was forty-one years ago. "Margaritaville" became the first hit single for Buffett. We played it like crazy then and it still plays on the radio, today. I particularly like his many live versions, of the song; some live versions even have an extra verse or two. "Margaritaville" is not only a song; it’s a state of mind. There are now Margaritaville Cafes all over the world. I've been to two of them. The mothership, as I call the Café, is in Key West, Florida, on Duval Street. The second Café is on the island of Grand Turk. I have t-shirts from both locations. The Buffett album Son of a Son of a Sailor released in 1978. The hit single, from this album, was "Cheeseburger in Paradise." The Buffett 2018 tour celebrated the fortieth anniversary of the album and the single. Parrotheads are dedicated for life to Buffett. There are Margaritaville retirement communities (above, top), catering to adults fifty-five years of age and over. There’s a retirement community in Hilton Head, SC, and another in Daytona Beach, FL. Plans are ready for a third community at Watersound, FL, near Panama City, on the Florida panhandle. 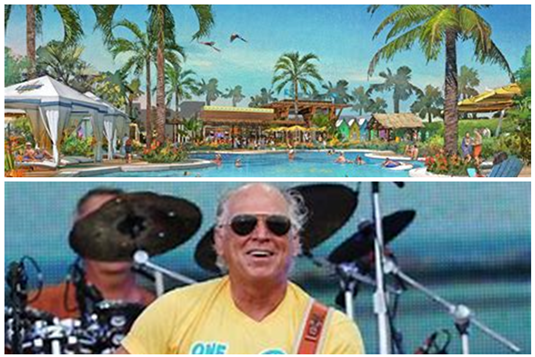 If a Margaritaville-themed retirement community opens in Central Florida, that's where I'll end up in four years when I want to retire and move. Here's my Top 10 Favourite Jimmy Buffett songs and why. (1) “Margaritaville” simply because it was his first hit first and it started the empire. (2) “Cheeseburger in Paradise” because who doesn't like cheeseburgers? (3) “One Particular Harbor” is a great story of getting away, relaxing and having fun. (4) “Boat Drinks” because who doesn't like boat drinks or drinking on a boat? (5) “It's 5 O'clock Somewhere” is true statement and who doesn't need a vacation every now and then? (6) “Coconut Telegraph” -That's not only a song title, but the newsletter mailed out to Buffett fans, in the 1980s, from The Key West Margaritaville. The newsletter contained music news and merchandise offerings. I still have several issues. (7) “Mexico,” James Taylor says this is his favourite Jimmy Buffett song; of course, as he wrote it. (8) “Brown Eyed Girl,” written by Van Morrison who says it’s favourite Jimmy Buffett song and not because he wrote it. I like it because I have two browned eyed girls. (9) “Changes in Latitude, Changes in Attitude,” say, yes, we all like to be insane. (10) “Son of a Son of a Sailor” homages his father and grandfather who were both sailors. It's a great song. When I got my new car, I changed my SiriusXM subscription from the Mazda to online and the app, because the Equinox isn't equipped with satellite radio. Now, I can listen to Channel 24 Margaritaville anywhere, along with some other great channels like 80s on 8, Deep Tracks, Classic Vinyl and The Bridge. I guess I am a Parrothead, after all. I don't own a parrot though. Maybe I should buy a parrot and call him or her Monday.